Black and white is a timeless combo that never goes out of style. It’s chic, elegant and you can’t go wrong wearing it. But this fall is all about black and white print. Eye-catching patterns in our favorite duo of hues are one of the season’s must-haves. If you’re looking for something new to add to your at-work wardrobe this fall, we suggest this sophisticated sleeveless shift in elegant black and white tweed ($188). The fitted bodice with pleats at the waist makes for an ultra-flattering fit and we love how effortless it will be to dress this piece up with some statement jewelry and platform pumps. Is there anything better than pulling on a cozy sweater on a crisp fall day? We don’t think so, which is why we’re already stocking up on stylish knits including this black and white beauty featuring a graphic geometric pattern perfect for wearing with anything from jeans to tailored trousers ($230). 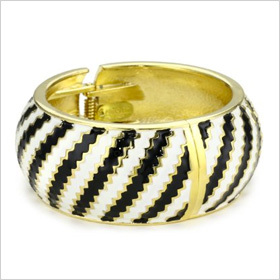 Accessorize in style this fall with an eye-catching black and white enamel cuff with gold accents ($80). Wear it with your favorite LBD and printed heels, or simply use it to add interest to a lazy Sunday pairing of jeans, graphic T-shirt and flats. It’s versatile enough to be dressed up or down, which makes it a smart buy for a new season. We’re mad about miniskirts for fall and this super-sleek paneled Rag & Bone piece is no exception ($290). The fitted black jersey skirt features a panel of black and white print along the middle for an eye-catching twist on the classic mini. Pair with ankle boots (a fall must-have) and a tailored blazer for a chic, on trend midday or evening look. Amid all the booties and heels we’ll be sporting for fall, we’ll also be sure to throw in some comfy but stylish flats. 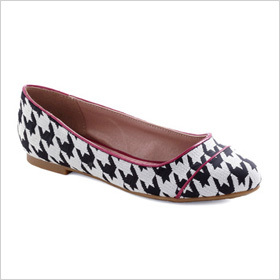 Our next purchase will likely be this pair in black and white houndstooth with a pop of red piping ($50). 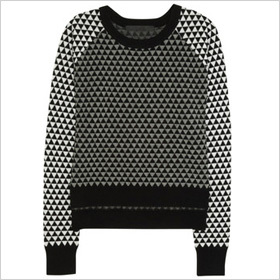 Wear with skinny black trousers and a pastel button-up, or pair with a pencil skirt, tights and cute cardi.